All applicants must provide two verifiable references. In accordance with the Rehabilitation of Offenders Act 1974, applicants may be required to comply with an enhanced disclosure of “spent” and pending convictions. Collagen is a natural protein that provides the structural support and shape to the skin. Collagen cells reduce in number as we age causing our skin to loose it's elasticity allowing fine lines and wrinkles to develop. 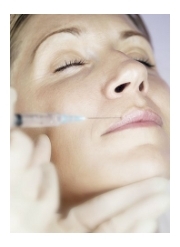 Collagen Replacement Therapy using dermal fillers allow you to temporarily reverse the signs of ageing. Dermal fillers are a safe, quick, affordable and relatively pain free alternative to major surgery. This treatment can be used to plump out fine lines and wrinkles around the mouth, forehead, nose to mouth groves, crows feet, acne pits and lipstick lines.